If you’re looking forward to the release of Album 59, Taking the Plunge, it might be a good idea to catch up on the episodes preceding. Beginning Saturday, June 20th, Album 58, The Ties That Bind, will air on radio stations (and online) each weekend preceding the airing of Taking the Plunge this fall. What does this mean? 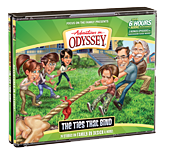 If you haven’t heard some of the latest episodes (yes, the first-ever 14-part Adventures in Odyssey episode is what we’re referring to), we recommend tuning in this summer to find out what’s happening in Odyssey. Of course, you can also purchase the full CD copy or download version view our links at our product page and hear it all at once. Or, if you’re a member of the Odyssey Adventure Club, you can stream it anytime there as well. In addition, Album 59, Taking the Plunge, is now available in full on the Odyssey Adventure Club, plus bonus video feature. So if you’re not big on waiting, head on over and hear the album there today. Otherwise, if you’re from the era of fandom in which episodes were only heard from week to week on the radio, you can give yourself something to look forward to each week by listening each Saturday as episodes air. Don’t miss The Ties That Bind this summer. To stay up-to-date, you can view our Weekend Schedule. You won’t want to miss all the excitement this summer, plus the debut of Album 59 on radio stations (and online) on September 26th!